Is it your understanding that DeHaan’s “medical” opinion regarding the origin of blood in humans is in error? What makes me wonder about Dr. DeHaan’s medical assertions is that the point made by all of the medical experts he cites, only document the fact that the mother’s own blood and the fetus’ blood are separate and does not pass from one to the other. The formation of blood post-conception is not documented, but only asserted and illustrated–by the formation of blood in the egg of a hen. Also, he writes that, “An unfertilized ovum can never develop blood since the female egg does not by itself contain the elements essential for the production of this blood. 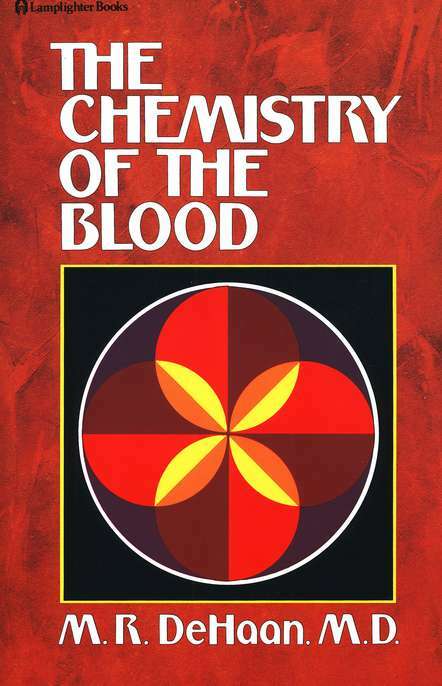 It is only after the male element has entered the ovum that blood can develop.” He never attempts to prove that the male sperm has solely in and of itself the capacity to form blood. It seems to me it wouldn’t have this capacity until it fertilizes the egg and combines itself with the properties of the egg. Of course, I have no medical training as De Haan had, but he hasn’t proven this point, only asserted it. That leaves room for doubt. But the primary dispute is with the fact that he’s allowing his medical knowledge to color his interpretation of Scripture to the extent that he’s crossing the line between the orthodox position of the full humanity of Christ and entering the realm of the, if you will, “more than full” deity of Christ and the “less than full” humanity of Christ. Let all things, whether, philosophy, medicine, world view whatever, be viewed by the lense of Scripture, and not vice versa. Jesus is 200%. He is unique in all things because of this fact…He is 100% man, and 100% God…He is 200%. If I was a kissing man, I would kiss you! Don’t worry Gage, Fort Worth and Dallas metroplex is very big and a needle your size is hard to find even if John knows where you are all the time! I just quivered when I read it, that is DeHann’s interpretation of the birth of Christ! I’ve heard this stuff about Jesus’ blood being “divine” for the past 14 years or so, and it doesn’t make me quiver, now it just makes my stomach turn. On the other hand, there’s nothing more exciting to me than orthodox doctrine!!! oh and by the way… I’m definitely…a filet mignon…the Cap’n is fish and chips…that’s what all Cap’ns are. Shiver me timbers, let’s get back on topic, brethren! But thanks for padding my stats! I am convinced the hypostatic union is a valid Biblical Truth. I have always heard that the blood comes totally from the male of the species. I will research that topic. In in case, we are talking about God becoming totally man without losing His totality as God. If nothing else, God always transcends our finite thinking with His infinite wisdom. Look closely at what the angel told Mary about the process and result of her conception: “And the angel answered her, ‘The Holy Spirit will come upon you, and the power of the Most High will overshadow you; therefore the child to be born will be called holy—the Son of God. '” The result of the Holy Spirit’s power is the holiness of the child. The Holy Spirit is the agent of all sanctification, even that which separates the human nature of Christ from any imputation of Adam’s sin to him, or any actual tendency toward sin in the body itself. To attempt to zoom in on it more than that would be like asking what God was doing before he created the world–if we start trying to infer this or that, we will lead ourselves astray from the revelation of God and will fall into a ditch with other blind guides and their followers. Finally, it is the case that the orthodox presentation of the two natures of Christ in one person (“without confusing the two natures, without transmuting one nature into the other, without dividing them into two separate categories, without contrasting them according to area or function” — see the Definition of Chalcedon above) is as you put it “God becoming totally man without losing his totality as God.” And yes, God’s infinite wisdom lies beyond what he has revealed to us in his Word, and it behooves us to be careful not to go beyond what he has revealed to us in his Word because our thinking is indeed finite. We dare not make stuff up that’s not revealed explicitly in his Word, or deduced “by good and necessary consequence” (Westminster Confession of Faith, chapter 1, section 6). The fact that DeHaan’s “deducing” that the blood of Christ is divine puts us back in pre-Chalcedonian days when the human nature of Christ is “confused” with the divine nature of Christ, is proof that his deduction is not derived “by good and necessary consequence,” and thus far has he led us out of the realm of orthodoxy and far too close to that infamous “ditch.” That which is deduced by good and necessary consequence will keep us within the realm of orthodoxy. Let us build our Christology on the shoulders of the orthodox guides from fifth century Chalcedon who have done the best job of keeping the church between the guardrails of Scripture. Believers have invented all sorts of creative ways to “protect” Christ from inheriting man’s sinful nature. The fact is, once you understand federal headship, you realize it’s unnecessary. . . Christ doesn’t need our help to remain untarnished. It’s amusing and sad that we continue to view SIN as PHYSICAL. We tend treat sin as if it is a communicative disease that we all catch in the womb – or perhaps think by some breakthrough we can pinpoint it’s molecular makeup and find a way to cure it. Adam was not Jesus’ representative – Christ was the second Adam. I have done an extreme amount of meditation or pondering or thinking on that Bible verse and I cannot say I find a day where it does not thrill me to the marrow of my bones! represented. We are sinners by nature and riddled with guilt by the imputation of Adam’s sin. Adam’s sin is enough to condemn us. Thankfully, Christ’s righteousness is more than enough to stand in the court of God as righteous! Thanks for that, Gage. I was beginning to detect the need for clarification on federal/seminal headship myself. death and corrupted nature conveyed by ordinary generation–Seminal Headship. Huh…your explanation is much shorter and much clearer than mine. But yes. But yours has the advantage of being an actual exposition of Scripture, whereas, mine is merely an exposition of the confession. One step removed. Ahh yes, but the confession is an exposition of scripture… and a lovely one at that. How very Presbyterian of you. And of course, I mean that in a good way. Does that “good and necessary consequence” stuff not apply to the Westminster Confession? Since the reference to deducing “by good and necessary consequence” that which is implicitly taught in Scripture is the explicit teaching of the Westminster Confession, then that would mean that the writers of the confession (along with those who confess it is “the system of doctrine contained in the Scriptures” ) believe(d) that that which is confessed is either explicitly taught in Scripture, or is deduced by good and necessary consequence. Are you wishing to compare DeHaan’s deductions to those of the Westminster Divines? I would say that to date those of the Westminster Divines have already been confirmed to a far greater extent than DeHaan’s ever will be. Or do you have some other point in mind?